If you think shooters like the B-52 are are modern things, guess again. 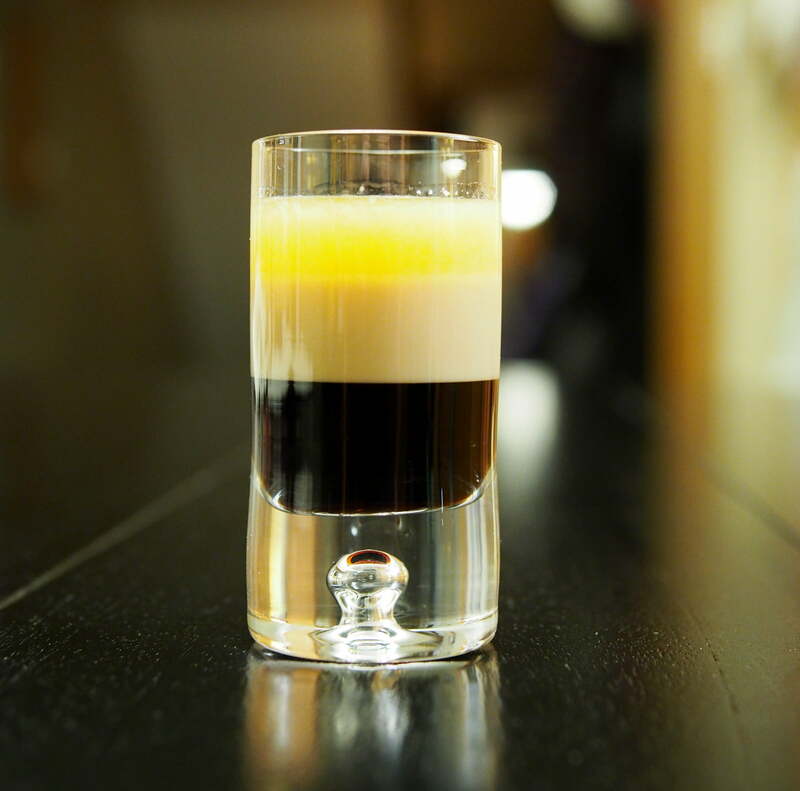 The Pousse Cafe was popular in the 1860s, and the French word pousse translates to shoot. The Santina’s Pousse Cafe was a mixture of Cognac, Maraschino and Curacao but instead of layering the recipe it instructs one to “mix well.” Eventually, the Pousee Cafe did become a layered shot of varying complexity, some recipes calling for eight different liqueurs. 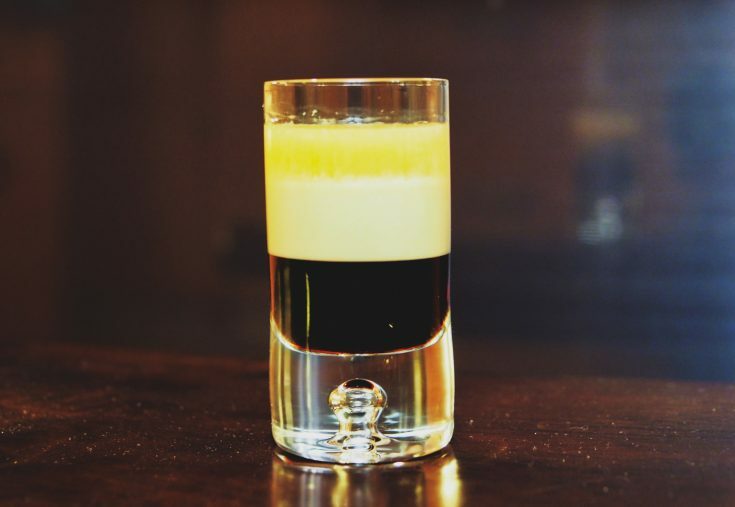 The B-52 is just a simple layered pousse cafe consisting of three ingredients; coffee liqueur, Irish cream liqueur and orange liqueur. Where it shines is the dessert-like quality, which is why it is so popular. The orange liqueur adds just enough of a bite, so it isn’t cloyingly sweet, though it is pretty close. Peter Fich, the head bartender at the Banff Springs Hotel in Banff, Alberta (Canada) is said to be the creator of the B-52 in 1977. The drinks name is a reference to the band the B-52s, not the bomber. The band took the name from a beehive style of hairdo popular in the 1950s that resembled a skep type beehive. The B-52 Stratofortress bombers nose-cone resembled a skep, so the hairstyle was also known as a B-52. So don’t append “bomber” to the end of your shot order. The first shot I legally downed was a properly layered B-52 when I turned 19 at a bar called The Otherside in Sarnia, Ontario. It was our college hangout, and many drinks and chicken wings (5¢ each in 1990) went down the hatch. It was our place, and there were a lot of great memories, like the time we spent all out student nickels and didn’t have enough for a tip. We were regulars, begged forgiveness and promised to make it up next week. We did, by tipping double before we ordered anything the following week which endeared us to the wait staff. The shots were always appropriately made, so I have positive memories. Most other B-52 shots I’ve had were pre-mix in a plastic pour jug, and I can tell you it was not the same. There is something about the three layers where each flavour gets a fraction of a second in the spotlight. Expediency never tastes the same as care and mindfulness. Appearance and effort are admirable traits. 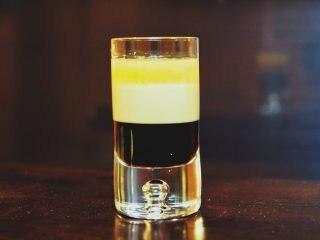 Professional bartenders have brought classic cocktails back, and I think good bartenders should make decent shots because they aren’t going away, so let’s do them well. Besides impressing customers, many of the favourite liqueur based shots are lower in alcohol so things won’t get out of control as fast as slamming back bourbon. Though one always needs to be careful. I do like the “bartenders handshake” which is a shot of Fernet, it is a sign of friendship and shared pain because only bartenders know what bartenders go through. I’ll never turn the Fernet gesture down, but some days I want to go old-school and for a bartender to layer some B-52 shots like it is the 1990s. If we’re going to make things even more interesting, an alternative handshake should be the Santina’s Pousse Cafe because Cognac, Maraschino and Curacao sound like a tasty combination. A simple three ingredient shot that looks great and tastes pretty good as well. If you remember anything from this post, it should be this; the B-52 is named after the band, not the bomber so you should never, ever order a B-52 Bomber, that’s just wrong.